That sauerkraut looks so good. I've never made sauerkraut myself, but I've watched my parents make it. They taste it all the time while it's fermenting--"do you think it's done yet? isn't it done already?" --until it has that spicy tang. Thanks for pointing out the recipe. You're right about the pointlessness of asking Russian women of a certain generation for recipes. They aren't the types to measure out ingredients. 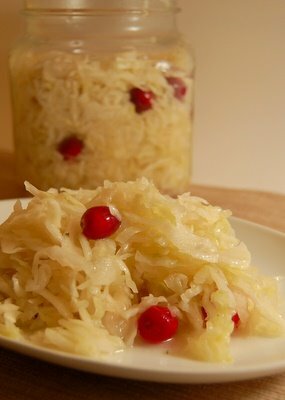 After making this sauerkraut I compared notes with my Grandma. Now that I have the basic recipe, her tips come in very handy. She confirmed my suspitions that it only takes 4-5 days, not 10-15 as the recipe suggested until sauerkraut is done and you can move it to the fridge. She said, no need for the wet cheesecloth. Just cover cabbage with a plate and place a heavy glass jar on it to weigh it down. She also gave me a tip on packing it into the bucket or pan you are using for fermentation -- use a potato masher. Russian food stores, e.g. Bazaar in Brookline, typically have a pretty good home-made suerkraut. I like sauerkraut from Russian stores too. Another store bought one that's even better is by "Real Pickles" company. You can buy it at most Whole Foods. Thanks for visiting my blog. Hope to hear from you again. That IS how 99% of the people in the world make sauerkraut. Am I missing something ?where is the recipe?